HSE Appreciation Award received for 5 Million Safe Man Hours without LTI in Al Dabbiya Surface Facilities Phase III Project. We are pleased to announce the facilitation by Tecnimont and ADNOC onshore of “Safety Award to ROBT.STONE for Successful Completion of 5 Million Safe Man hours without LTI in the Project” Al Dabbiya Surface Facilities Phase III and to be part of Project achievement of 25 Million Safe Man-hours without lost time (LTI). 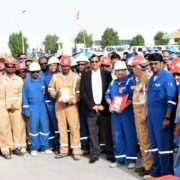 This achievement clearly shows ROBT.STONE Top Management and Project team commitment towards the establishment of an effective system for managing occupational safety and health standards and to inculcate this aspect of Safety Culture in the daily duties to achieve 100% HSE goal while focusing on ADNOC safety rules and regulations. We congratulate all our TEAM members for their remarkable contribution to this enormous achievement and encourage everyone to continue their efforts towards Safety in the same manner until Completion of the Project. http://www.robtstone.com/wp-content/uploads/2018/05/HSE-Appreciation-Certificate-5-Million-DYA-2018.jpg 1808 6000 Jimson Antony http://robtstone.com/wp-content/uploads/2014/06/robtstonelogo_161x53.jpg Jimson Antony2018-05-20 13:23:052018-05-20 13:23:11HSE Appreciation Award received for 5 Million Safe Man Hours without LTI in Al Dabbiya Surface Facilities Phase III Project. “Subcontractor of the Month” Award (April 2018) for Al Dabbiya Surface... Best Subcontractor Camp of the Q2- 2018 Award from Tecnimont.